Description: The traditional Emperor’s Journey is meant to be uneventful. But as the princesses Seika and Ji-Lin—twin sisters—travel to pay respects to their kingdom’s dragon guardian, unexpected monsters appear and tremors shake the earth. The Hidden Islands face unprecedented threats, and the old rituals are failing. With only their strength, ingenuity, and flying lion to rely on, can the sisters find a new way to keep their people safe? "Stories are how we understand who we are and who we wish to be. Heroes. Traitors. Both at once. We define ourselves by the stories we tell. We shape ourselves by the stories we hear." 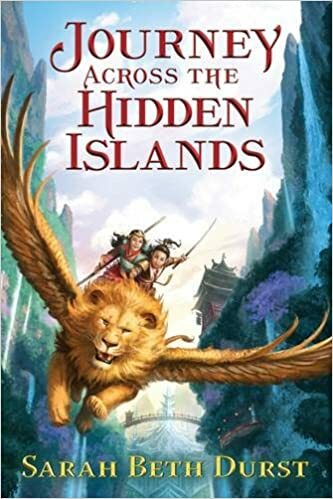 My Thoughts: Sarah Beth Durst tells us a story about two twelve-year-old princesses on a hidden island who have to make a journey to renew the promises made to the dragon who keeps the islands hidden and who protects them from Koji - dangerous monsters. Ji-Lin is the younger sister - by eleven minutes. She has spent the last year at a monastery learning to be her sister's protector and warrior. She has as her companion Alejan who is a winged lion who is also young and also in training. Seika is the older sister, heir to the throne, who has spent the last year learning to be a princess and heir and learning the stories and rituals. They are both very young to take this journey and, almost right away, things begin to go wrong. Despite the protective barrier cast by the dragon, Koji are finding their way into the hidden islands. Their first stop is being plagued the something that is stealing their sheep. Ji-Lin wants to stop and fight the monster as she has been trained but Seika convinces her that the journey is more important. Their next stop has a resident Koji which causes the girls and Alejan to try to sneak around the town. They do find the residents but lose precious time on a journey that has a deadline. An encounter with explorers who are battling a water Koji also slow up their journey. On the ship from outside the barrier, they meet a boy their own age who is dying from a bite from one of the monsters. The girls know the cure and take Kirro along to cure him. He becomes their companion for the rest of their journey. Meeting him, and hearing his stories, opens the girls to new ideas - ideas that that really don't want to believe. They begin to wonder about being heroes and if what they have always been taught was the truth or just another story. I really enjoyed this book both for the adventure which should appeal to any middle grader and for the way the two girls grew and changed through the book. I am not a big fan of talking animals but I also really enjoyed Alejan who has to come to his own terms with the stories he's been told and the heroes he's admired. "I'm not afraid." Princesses weren't afraid. Terrified, maybe. Her tutors would be appalled if she felt anything as common and small as fear. She was permitted to be terrified, though -- but she was terrified in a good way, in a way that made her feel as if all the blood in her veins were singing. I received this one for review from the author. You can buy your copy here.